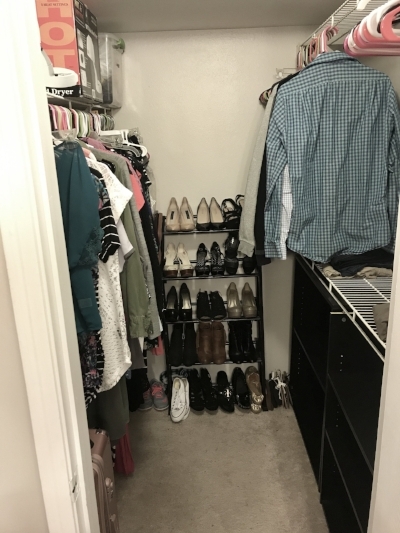 If I could describe the feeling in my being as I walked into my new cleared and opened closet it would definitely be free. 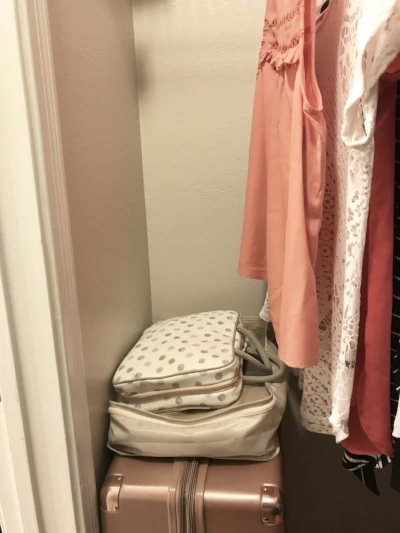 Most people say on this journey of minimalism via decluttering you shouldn’t start in the closet. It’s usually the most packed place of nostalgia and filled with decades of your life. It usually houses some of the things that you need to let go but have some sort of underlying connection to that doesn't let you part. It is said that most feel overwhelmed when trying to sort through, declutter, and organize their closet and are more likely to give up before they've even started. I decided to start with my closet because of the aforementioned reasons alone. I knew it would be the place that would be the hardest to part with things but it would be the most rewarding and freeing. I felt that once I tackled this goal I would then have enough momentum to finish the rest of my home. And guess what, it worked! I wouldn't consider myself much of a hoarder but I do have a lot of stuff. Stuff that once served purpose or that I have lingering around for the just because. I think my relationship with clothing and shoes in particular has been a bit of comfort over the years. Knowing that I have something for just about every occasion and a closet filled with clothes and shoes is what I once deemed as “you've built a life for yourself”. Of course as I've grown older things have changed and I find myself caring less and less about name brands and having a bag to match every outfit. Over the past 6 years of serious adulting the frugal queen in me began to emerge. This included thrifting, couponing [oh the dangers of stockpiling :)], and constantly bargain shopping through clearance. The danger of this is because things are so cheap I find myself buying more! "Oh hey I'm only spending $10 on this top so I can buy 5 more :)". Mistake! Truth is, last Saturday I stared at all of these things that have piled up over the years and very little spoke to me. So I turned on a podcast and started there. Clothes, then shoes, then everything else I had piled into this space. When going through clothing and shoes I took a look at each item individually. If I had not worn it in the past 2 seasons I would be donating it. Same with shoes. I then tackled the other miscellaneous things like my stockpile bookcase filled with hair and beauty products I've collected from either my hair product junkie period or from couponing. I kept one of each if it was something I readily used. Other bottles that I'd hadn’t used in awhile were tossed if had been opened or put in a pile to mail to my younger sister. 2.5 hours later I was finished. Breath of relief as I looked into my now open decluttered closet. This is only the beginning. Next step: living room and kitchen.